I was always curious about Army wives. You see, I had heard stories. Whispers and rumors, more like. But I had no clue that Army wives had a strict dress code. No showing skin, legs. That kind of thing. And the golden rule is - Hierarchy rules! Never ever say 'No' to a request by your husband's superior's wife. When I mentioned this to my always-logical-and-practical husband, he scoffed, " That cannot be true. Its just your imagination. You are talking about the Indian Army, for god's sake. Not some kitty club." 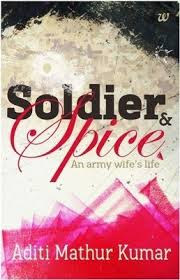 Well, after I read Aditi Mathur Kumar’s novel "Soldier and Spice," I knew it wasn't my imagination at all! Soldier and Spice is a full-of-life book. It keeps you informed about the life of Army wives in India. When you finish reading the book, you will be wonder, "Is all of this (examples: the memsaab part and men standing up every time a lady stands up in the Officer's Mess) really happening in independent India?" The protagonist is a newly married girl called Pia, who comes from a "civilian" background and is clueless about the Army life. She loves her handsome Army man and is willing to adapt to the new life ahead though she doesn't know how to cook, throw a party or live by the Army code of life at the time. This novel captures the nuances of what the life of an Army wife can be like. Something unexpected happens. Pia’s world falls apart for a while but she sifts her way through the trials, the sorrow, the grief and even the issue of dealing with gossip of some idle minds. She provides emotional strength to her husband and supports him at every phase. Teaches you one powerful fact: Even the strongest Army man gets injured and it's the wife who can get him to be back in action! Aditi Mathur Kumar’s novel Soldier and Spice is a thought-provoking read that tells you everything you want to know about an Army wife's life.